Probabilistic Reliability Assessment (PRA) helps transmission system planners create designs that will be more robust in the face of increasingly uncertain operating conditions. It also assists decision makers prioritize transmission projects by balancing reliability and risk. In order to take into account these new uncertainties and complexities, transmission planners need innovative approaches to calculating power system reliability. Traditional modeling tools use a deterministic approach to calculate the impact of potentially disruptive events, without regard to the probability that they would actually occur. Now, however, planners need to take a probabilistic approach so they can quantify both the impact and risk of such contingencies, as they decide what new transmission facilities are required to enhance power system reliability. 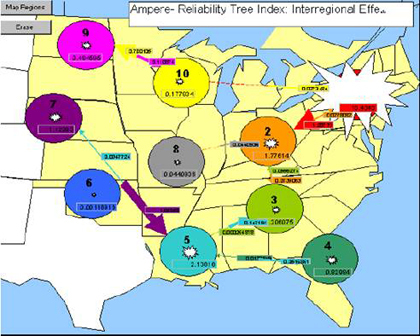 eMIT has developed effective new tools and methods for probabilistic reliability assessment (PRA), under EPRI's Power Delivery Reliability Initiative. PRA has been successfully implemented by various energy companies in planning studies of growing complexity. Unlike traditional deterministic methods, PRA calculates a measure of the probability of specific contingencies, together with a measure of their severity or impact. Such PRA methods have proven effective in analyzing many kinds of problems arising from interactions in multiple factors in complex systems. The new PRA methodology thus offers the electric power industry a more accurate tool for assessing grid reliability under restructured market conditions. Interaction analysis unveils cause and effect relationship among user-defined zones. Situation analysis ranks contingencies according to their contribution to reliability indices. It also helps planners identify the scenarios that have high impact or high probability or both. Root cause analysis indicates transmission system components most likely to contribute to critical situations. Weak points analysis identifies specific power lines and buses most susceptible to interruption. Probability margin analysis establishes the relationship between reliability indices and stress levels. It provides a measure of system robustness. Which facility outages would most jeopardize system reliability? Which components are most affected by the outage of other facilities? Where are the power system's bottlenecks? What remedial actions would most efficiently overcome system's vulnerabilities? How reliable is the power system at any given time according to a predefined objective? The results from the above analysis are then used as input to the PRI program, which computes probabilities for various contingencies. It then multiplies the probability of critical contingencies times potential impacts to determine their reliability indices. By considering not only the severity of impacts caused by a contingency but also the probability of that critical contingency, this probabilistic approach provides a better way to measure power system reliability and creates new insights into understanding system behaviors.